The concept is to take a small balance and grow it exponentially following the Dutch systems included in the service. This is achieved through backing multiple value horses in the same race to make the overall strike rate high. Exponential Bet is a service a little different from the tipsters we normally monitor and rate. The concept is to use ‘Dutch Betting‘ through the Betfair Exchange BSP multiples facility. In very basic terms the idea is to cover a large number of horses in each selected race to increase the strike rate and make almost all bets return a modest profit. There is far more to it than though – selecting the correct races and of course horses is crucial to long-term success and that’s what we will be monitoring as this review progresses. Currently we are excited to try something new but will await long-term proofing results and extensive testing before recommending it as a viable investment method. Dutch System Four is an additional service launching shortly. This will also be monitored and a results update will be provided in due course. Commencement date November 17. 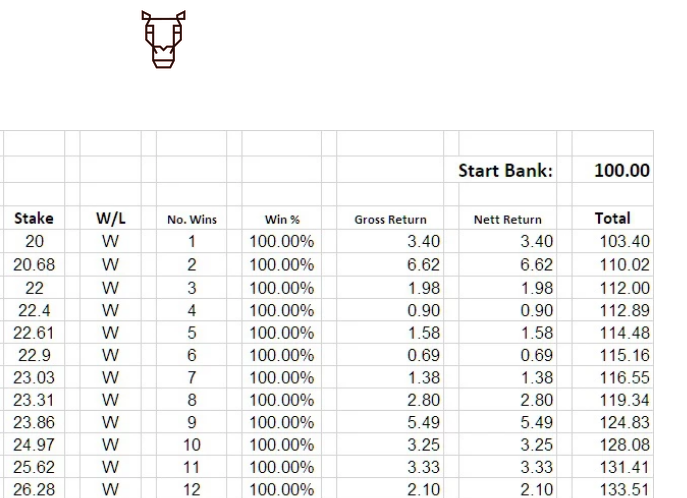 The focus of this review will be on the first and third systems which have a 99% and 100% strike rate respectively with average bankroll growth of 456.50% across both services. These results have been recorded over months but as always with Checkatipster reviews we only use proofed results that we have verified before commenting on a systems credibility. The Checkatipster team will now follow the service and will provide regular updates regarding performance and other factors relevant for those considering purchasing a subscription. Results will be recorded from Saturday 28th October 2017 onwards. Following this advisory returned a £1.60 profit (from £10 liability as the total bankroll our team are using for the initial review is £100 and a 10% stake is advised). That’s a 16% Return on Investment (ROI). So by no means does this look to be a ‘get rich quick scheme’ but that’s certainly a good thing. As an investment product it’s clear why it would appeal. The strike rate is exceptional as virtually all probable outcomes of each race are covered. The Checkatipster team will continue to monitor the service to evaluate consistency long term. The next stake will be £10.16 (10% of total bankroll) for the Dutch System Three Service. The gains may seem small but the stake size will naturally increase as the total bankroll grows and crucially the service looks to be focused on protecting bankroll and limiting risk far more than a standard sports tipster would. 2018 Update: As an investment style service it’s hard to fault. Stable and consistent results for patient members. Ryan, who runs the service, is disciplined and selective which shows in terms of the long term attainment and infrequent losses. Improvements and innovations are also announced regularly. Highly recommended for individuals ready to commit for the long term with a significant bankroll.